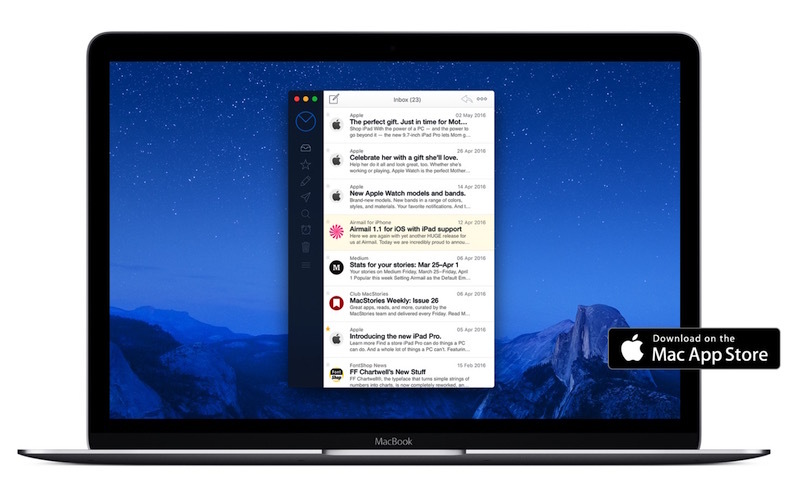 Airmail, the third party email client for Mac, has been updated to version 3, bringing some major new features to the popular application and a redesigned interface. The new update adds Smart Folders for enhanced message filtering and organization, VIP contacts, OS X notifications, and support for the "send later" feature available to Gmail and Exchange account holders. The Mac update also means that Airmail for OS X now syncs account preferences across iPhone and iPad devices, syncing rules, VIP contacts, and Smart Folders over iCloud. Airmail 3 supports multiple accounts including MS Exchange, Gmail, Google Apps, IMAP, POP3, Yahoo, AOL, Outlook.com, and Live.com. Other new changes bring options for customizable menus, gestures, keyboard shortcuts, and folders, as well as calendar integration, rules for forwarding messages, Asana and Trello integration, primary inbox support for Gmail, and redesigned message threads. Am I literally the only person who uses the stock Mails app on OS X? Suits all my basic needs. Nah I use it to run 5 e-mail accounts with multiple alias' and about 600,000 e-mails in the database. Works fine for me. Most of these other clients seem to be about dismissing e-mail so you always have an empty inbox - I don't work like that. Each to their own, Mail works fine for me, the only feature missing was send later, so I bought a plugin for that. No, you're not! And I think it works great. I hate app-store apps. Is there any way to test drive AirMail? I have to pay out $10 to the app store just to figure out a couple days later that I don't like the app? I also use the stock Mail app. And I am no basic user. 4-5 mailboxes (Gmail, Google Apps, iCloud, Exchange), and over 100 messages every week. I have tested AirMail, UniBox and others. Thing I need the most is the reliability and compatibility. Other e-mail clients were far more functional but (more) unreliable, laggy and had compatibility issues with Exchange servers. I would love Apple to add better support for Gmail labels (instead of folders) and support for google push notifications (basically google API instead of IMAP) in coming release. I've been using it for years. I've tried other mail apps. But none of them gave me a compelling reason to switch. Any time I read about another mail app, I always ask what makes it better that Apple Mail. The typical response, "I just like it better" or "I just don't like Apple Mail". Same here and the same to the other posters who use default mail....it has always functioned for me with no issues. However I wish the interface had a little more color and contrast for artwork or icons as I might say. Wel.. I'm a Graphic Designer, and most of the time I use it to send large pictures (websites, logos etc) to clients. But the mail app is persisting to load the image into the mail itself. The option "Edit > Attachments > Add to end of message" doesn't work either. Doesn't work. Only turns images into icons and they still show up inside the body of the email. Mail app is pretty miserable. They are supposed to look like this, now they don't occupy as much space. My images are attached at the end, but in your case you could still easily drag them to the bottom if it annoys you. The Mail app is not miserable, your expectations don't meet how Apple designed this application.